Kopnina, Helen 2019. The nature of spectacle. The Journal of Peasant Studies, Vol. 46, Issue. 1, p. 220. Bruno-Lézy, Louise 2018. From Urban National Parks to Natured Cities in the Global South. p. 219. Taherzadeh, Oliver and Howley, Peter 2018. No net loss of what, for whom? : stakeholder perspectives to Biodiversity Offsetting in England. Environment, Development and Sustainability, Vol. 20, Issue. 4, p. 1807. Schneider, Helen 2018. Culture and conservation: a reply to Chua. Oryx, Vol. 52, Issue. 03, p. 417. Blair, Alec G. and Meredith, Thomas C. 2018. Community perception of the real impacts of human–wildlife conflict in Laikipia, Kenya: capturing the relative significance of high-frequency, low-severity events. Oryx, Vol. 52, Issue. 03, p. 497. Batavia, Chelsea Bruskotter, Jeremy T. Jones, Julia A. Vucetich, John A. Gosnell, Hannah and Nelson, Michael Paul 2018. Nature for whom? How type of beneficiary influences the effectiveness of conservation outreach messages. Biological Conservation, Vol. 228, Issue. , p. 158. Vucetich, John A. Burnham, Dawn Macdonald, Ewan A. Bruskotter, Jeremy T. Marchini, Silvio Zimmermann, Alexandra and Macdonald, David W. 2018. Just conservation: What is it and should we pursue it?. Biological Conservation, Vol. 221, Issue. , p. 23. Kopnina, Helen Washington, Haydn Gray, Joe and Taylor, Bron 2018. “The ‘future of conservation’ debate: Defending ecocentrism and the Nature Needs Half movement”. Biological Conservation, Vol. 217, Issue. , p. 140. Lopes-Fernandes, M. and Frazão-Moreira, A. 2017. Relating to the wild: Key actors’ values and concerns about lynx reintroduction. Land Use Policy, Vol. 66, Issue. , p. 278. Matulis, Brett S. and Moyer, Jessica R. 2017. Beyond Inclusive Conservation: The Value of Pluralism, the Need for Agonism, and the Case for Social Instrumentalism. Conservation Letters, Vol. 10, Issue. 3, p. 279. Batavia, Chelsea and Nelson, Michael Paul 2017. For goodness sake! What is intrinsic value and why should we care?. Biological Conservation, Vol. 209, Issue. , p. 366. Holmes, George Sandbrook, Chris and Fisher, Janet A. 2017. Understanding conservationists’ perspectives on the new-conservation debate. Conservation Biology, Vol. 31, Issue. 2, p. 353. Adams, William M. 2017. Geographies of conservation II. Progress in Human Geography, p. 030913251774022. Thomas, Sarah 2016. Editorial: Future Perspectives in Conservation Education. International Zoo Yearbook, Vol. 50, Issue. 1, p. 9. Neff, Mark W. and Carroll, Katherine 2016. A productive role for science in assisted colonization policy. Wiley Interdisciplinary Reviews: Climate Change, Vol. 7, Issue. 6, p. 852. West, Simon Cairns, Rose and Schultz, Lisen 2016. What constitutes a successful biodiversity corridor? A Q-study in the Cape Floristic Region, South Africa. Biological Conservation, Vol. 198, Issue. , p. 183. Child, M.F. (2009) The Thoreau ideal as a unifying thread in the conservation movement. Conservation Biology, 23, 241–243. Cronon, W. (1996) The trouble with wilderness: or, getting back to the wrong nature. Environmental History, 1, 7–28. Leader-Williams, N., Adams, W.M. 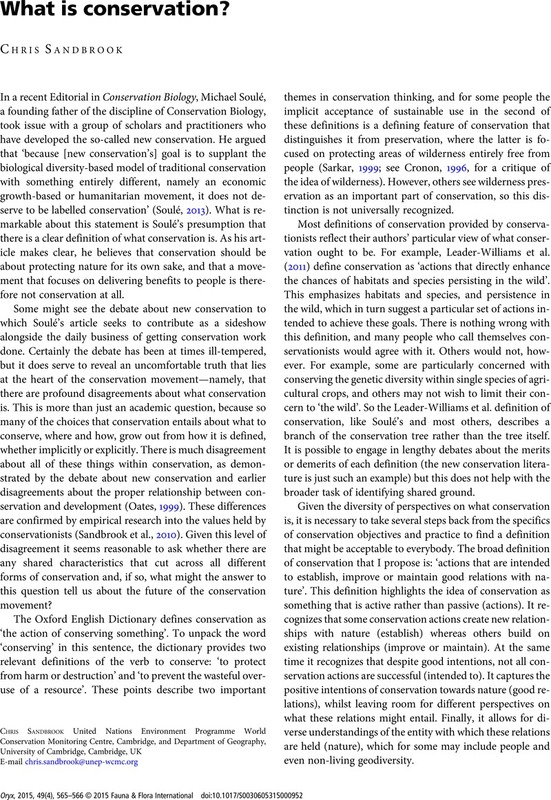 & Smith, R.J. (eds) (2011) Trade-offs in Conservation: Deciding What to Save. John Wiley & Sons, Chichester, UK. Oates, J. (1999) Myth and Reality in the Rain Forest: How Conservation Strategies are Failing in West Africa. University of California Press, Berkley, USA. Sandbrook, C., Scales, I., Vira, B. & Adams, W. (2010) Value plurality among conservation professionals. Conservation Biology, 25, 285–294. Sarkar, S. (1999) Wilderness preservation and biodiversity conservation—keeping divergent goals distinct. BioScience, 49, 405–412. Soulé, M. (2013) The ‘New Conservation’. Conservation Biology, 27, 895–897. Tallis, H. & Lubchenco, J. (2014) Working together: a call for inclusive conservation. Nature, 515, 27–28.